Rediff.com » Cricket » Stats: He is the BEST Test batsman in the world at the moment! March 1993 was the previous highest score by an Indian batsman at this venue. # Kohli has established a record for the highest individual innings by an Indian captain in Tests, bettering his own 235 vs England at Wankhede Stadium, Mumbai in December 2016. 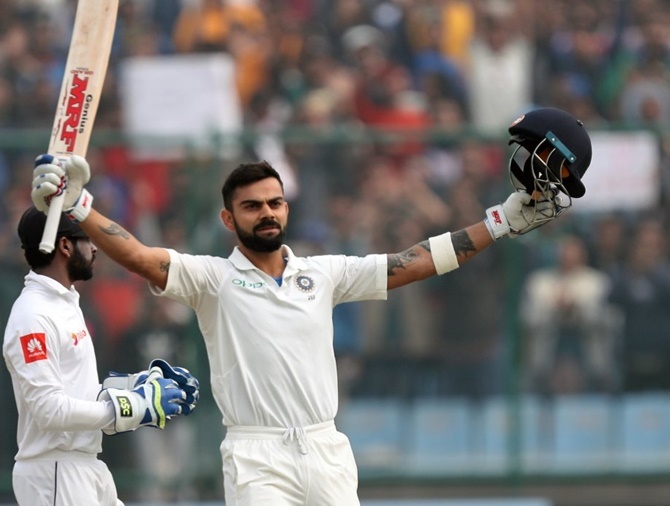 # Kohli has created cricket history by becoming the first captain to record six double centuries in Tests, eclipsing Brian Lara's tally of five. # Besides, Kohli and Kambli, four other Indian players have recorded double hundreds in Tests at Feroz Shah, Kotla -Nawab of Pataudi,jr., Rahul Dravid, Gautam Gambhir & VVS Laxman. four-Test series vs Australia in Australia in 2014-15. # Kohli's strike rate of 81.87 in the above rubber is the highest by an Indian skipper in a Test series when atleast 400 runs have been scored. The previous best was registered by Mohammad Azharuddin - 79.47 while scoring 426 runs in three Tests (five innings) at an average of 85.20 vs England in 1990. # Kohli's runs tally of 560 (ave.186.66) is the most by an Indian batsman in a three-Test series, eclipsing Virender Sehwag's aggregate of 544 (ave.90.66), including two centuries vs Pakistan in India in 2004-05. # Kohli became the second Indian player after Vinoo Mankad (vs New Zealand in 1955-56) and the 13th in all to post two innings of 200 in the same Test series. Don Bradman had achieved the feat four times, including three innings of 200- plus vs England in 1930. # Since 2016, Kohli has been in splendid form, aggregating 5363 at an average of 76.61, including 18 hundreds and 22 fifties, in 83 matches in international cricket. He remains the only batsman to amass 5,000 runs since the said period. # Since recording his first double century in 2016 – 200 against West Indies at North Sound, by Kohli, no other skipper has posted even a single double century in Tests. Joe Root's 190 vs South Africa at Lord's in July this year is the highest by any other captain during this period. # With six double centuries in Tests, Kohli has equalled an Indian record, held by Sachin Tendulkar and Virender Sehwag. # With 1009 runs (ave. 77.61) in ten Tests in 2017, Kohli is the first Indian captain to complete 1,000 runs in a calendar year twice. Last year, he had totalled 1215 runs at an average of 75.93 in 12 Tests. Apart from Kohli, two Indian captains have achieved the distinction. Sachin Tendulkar in 1997 and Rahul Dravid in 2006. (1934), India's Vinod Kambli (1992-93), Sri Lanka's Kumar Sangakkara (2007) and Australia's Michael Clarke (2012-13). # After their 173-run stand for the fifth wicket vs Sri Lanka at Nagpur, Virat Kohli and Rohit Sharma were associated in a vital stand of 135 for the same wicket in the Delhi Test. # India's 536 for seven wickets declared is their highest vs Sri Lanka in Tests at Feroz Shah Kotla, Delhi, obliterating the 375 for six wickets declared in December 2005. # India have recorded their joint-third highest total at Feroz Shah Kotla - their highest ever at this venue being 613 for seven wickets declared vs Australia in 2008-09. # Rohit's 65 is his third fifty vs Sri Lanka - his eighth in Tests. # Between 2013 and 2015, Rohit had managed 896 runs in 16 Tests at an average of 33.18, including two hundreds and four fifties and since 2016, he has totalled 455 in nine innings (7 Tests) at an average of 75.83, including a hundred and four fifties. # Dimuth Karunaratne has posted his tenth duck in Tests - his third vs India. # Angelo Matthews' unbeaten 57 is his 29th fifty in Tests - his fifth vs India. # In nine Tests this year, Matthews has recorded three fifties.